"A simple way to prepare duck breasts without the 'gamey' taste. Serve with wild rice and fresh bread for a special meal." Mix together salt and water. Set aside 2/3 of the mixture, and pour the rest into a glass baking dish. Soak the duck in the salt water overnight to remove the gamey. Change the salt water twice, or until mostly clear. The next morning, discard the salt water, and pour salad dressing over the duck breasts, and marinate for at least 8 hours. Preheat the oven to 350 degrees F (175 degrees C). 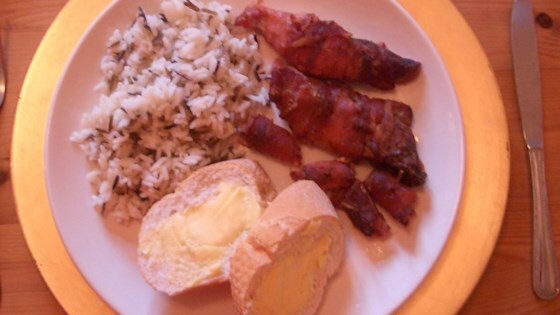 Wrap each breast half in one strip of bacon, and secure with a toothpick. Place the breasts in a 9x13 inch baking dish. Bake for about 1 hour, or until bacon is crisp, and duck is cooked through. Preheat the grill to medium-high heat. Grill duck breasts for about 30 minutes, turning once.